In the game of hoop, we often refer to an imaginary group of overseers – kind of like a — Hall of Justice, commonly labeled “The Basketball Gods.” This group presides over the game throughout the world, rendering justice or correcting injustice when needed (and believe me, it’s needed more often than you can begin to imagine). Since we’re all imperfect beings play the PERFECT sport — the Gods are needed to right the wrongs. It’s the proverbial block shot of any cheaters anthem. They play the role of the invisible odds makers, but their only vested interest is – good BASKETBALL. If you make a bad call — the basketball Gods will make the correct counter punch. Refs miss a call — you’ll probably get the ball back on the very next play. When there’s no refs, the power of fairness exerts itself in even more ways. Don’t believe me? — Ask anyone who’s ever played the game. Basketball has a built-in mechanism designed to protect the integrity from any negative influence and we appreciate it. The basketball Gods stepped in this year to make sure that we get the best of the best. 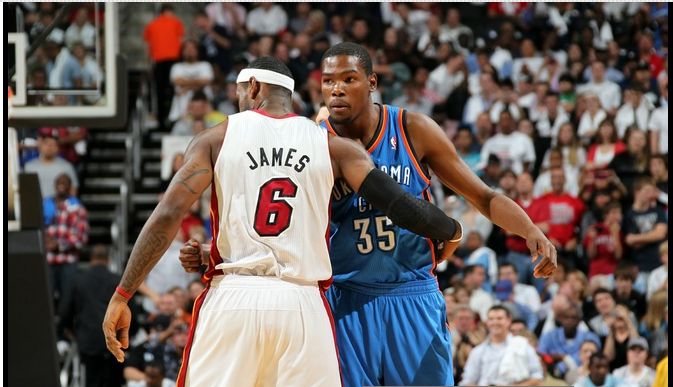 Kevin Durant vs. LeBron James for all the marbles! Great vs. Great. Small forward vs. Small forward. The best scorer vs. The best all-around player. 3 time scoring champion vs. the 3 time league MVP. Unselfish vs. Unselfish. NBA players often workout together in the off-season because nothing drives you harder than your equal. Kevin and LeBron went through their own version of Hell Week — in Akron, Ohio over the lockout summer of 2011 –lifting, shooting and swimming for 5 days straight. The best pushing the best to get better. Sure, it’s the Miami Heat vs. Oklahoma City Thunder — and the best team will prevail, but in a league focused on marketing superstars – the Gods have outdone themselves this time. Thank you.